Neasham Priory was founded in the early twelfth century for a community of Benedictine nuns. Today not a trace of it remains, having occupied a spot, it is assumed, somewhere under and around Neasham’s main thoroughfare on the north bank of the River Tees. It is remarkable, certainly, for one thing … and perhaps another. The known ‘surprising fact’ is that it was the only religious house in County Durham which was independent of the Durham Cathedral Priory – an astonishing state of affairs considering the Prince Bishop’s lengthy legal – nay, regal – reach. However, despite many grants, donations and privileges being bestowed upon the institution, the nunnery was never especially wealthy. Though the Dissolution came to Neasham Priory as it did to most other similar houses, the transition appears to have been a peaceful one. Thanks largely to the foresight of Prioress Jane Lawson, the building and grounds were able to be gently passed into the hands of her brother, James Lawson, a Newcastle merchant, in December 1540. Indeed, it is likely that Jane lived on as a tenant farmer in the nunnery buildings, which themselves seem to have remained intact and unplundered post-Dissolution, until her death in 1557. Surprising, then, that not a single stone remains in situ today. Would you like to write for the the North-East History Tour? See here for further info. At the southern-most tip of the Diocese of Durham lies the parish of Sockburn. It’s a busy little place, history-wise, though you wouldn’t think it looking at it today, amounting, as it does, to little more a large farmer’s field situated in a giant loop of the River Tees. There’s a nineteenth century mansion, a slightly earlier farmhouse and a ruined parish church – the much contracted population numbering little more than a few dozen (if that). There seems to have been something about the place, though, in times past which attracted the great and good to the spot. Higbald, Bishop of Lindisfarne, was crowned there in around 780 – ditto Eanwald, Archbishop of York, in 796. What are described as ‘Viking Age sculptured stones’ lie (still, I think) among the ruins of All Saints church, which add to the mystery of the place – as does the legend of the Sockburn Worm (or Dragon), slain by the Conyers family who for centuries owned the manor. The creature is said to be buried hereabouts. Due to its geographical situate, Sockburn was for centuries the spot where each new Bishop of Durham was ceremonially welcomed into the diocese by the Lord of the Manor – a practice recently revived, in fact. William Wordsworth, Samuel Taylor Coleridge and Lewis Carroll all have connections with the place – which encounters seem to have found their way into some rather famous works. Coleridge’s Love was written at Sockburn after the married poet fell for local girl, Sara Hutchinson, whilst staying at her brother’s farm. And Carroll is supposed to have based Jabberwocky on the legend of the ‘worm’ – though the Lambton Worm also claims this distinction. Get more of a feel for the place here. Meaning, ironically, ‘the new dwelling’, the deserted medieval village of Newsham sits on the northern bank of a wide curve of the River Tees, a few miles upstream from Yarm. Only a few house foundations and earthworks remain today – abandoned by 1600, the historians tell us, and ‘seldom occurring in the records’. Surveys conducted on and around the site have been able to trace a central ‘hollow-way’, bounded by 8 plots, or tofts – as well as another eleven ‘house platforms’ thereabouts and a chapel site (St.James). Ridge and furrow can be discerned in fields around and about. Newsham was (and, I suppose, still is) an ancient township of the parish of Eaglescliffe. Despite the early demise of the village itself, ‘Newsham’ lives on in the names Newsham House, Hall and Grange, but the original estate has now been thoroughly dismantled. It seems the farming folk round these parts regularly gathered to partake in various social get-togethers, despite the absence of a real ‘settlement’. Those days are, however, fast fading into history. There’s not much to see at the site, but there is a nice picture of the grassy expanse in this document. reuse under this Creative CommonsLicence. 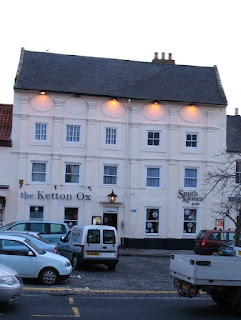 The Ketton Ox public house, a fine-looking affair at No.100 High Street, Yarm, has a history stretching back, in various forms and under many names, some 400 years. It must have enjoyed its fair share of custom during the town’s long reign as one of the region’s premier coaching stops – to say nothing of Yarm’s status as the Tees’ primary port before the rise of Stockton and Middlesbrough. However, as elegant as it looks today, the establishment has dark associations with the once rampantly popular sport of cockfighting. Indeed the place was well-known for its gory gatherings when it was a legal pastime; but come a rather inconvenient change in the law in 1835, it had to move with the times… the landlord switching the venue to another room – conveniently fitted with a trapdoor to permit escape if the place was raided! 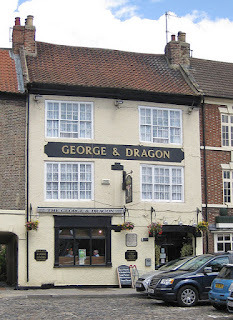 Being over four centuries old, the pub is, of course, haunted, with all manner of ghostly going-on, it would seem. Many put this down to the fact that the pub was once used as a morgue, primarily for bodies which, from time to time, found themselves floating lifeless in the River Tees. The oldest inn / public house in Yarm is probably The Ketton Ox, neatly situated at No.100 High Street. It is named after the famous bull of the same name which is illustrated above. This immense animal, better known in later life as the Durham Ox, lived during 1796-1807, and was an early example of what came to be known as the Shorthorn breed of cattle. Bred by Charles Colling of Ketton Hall, near Darlington, it hit the headlines after being exhibited in Darlington in 1799. 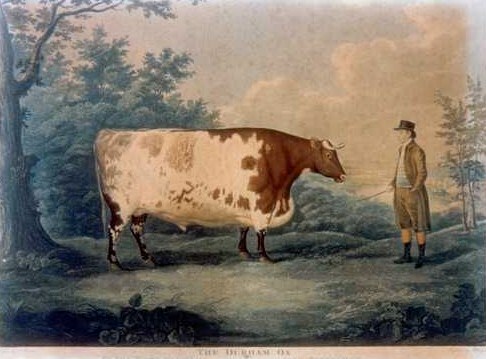 In 1801, John Day bought the beast and renamed it the Durham Ox, showing it to gawping crowds far and wide across the land – spending most of 1802 in London alone. Its weight was variously given as 171 stone – 270 stone, but its bulk was to prove its undoing when, in February 1807, it damaged its hip getting out of a carriage and had to be slaughtered several weeks later. It was said to be 189 stone dead weight. Its legacy lives on in many an etching and painting (its image was even set in porcelain) – and in dozens of pub names around the world. Astonishingly, a town in Australia is even named after it. The first public railway in the world. Thomas Meynell, esq., of Yarm, presided. Strangely enough, though, it wasn’t the first meeting of the railway pioneers for the construction of the famous S&DR – but it was the one from which the third, and successful, plan emerged which would eventually be approved by Parliament in April the following year. Though it may seem utterly unbelievable today, the town of Yarm, in the very depths of North-East England (and eighteen winding miles from the sea), was once the premier port of the River Tees. The industries of Middlesbrough, Stockton and Billingham – all downstream – now far outstrip Yarm in terms of river traffic, yet for centuries this was far from the case. Until the building of the bridge at Stockton in 1771, the aging structure at Yarm was the nearest crossing point on the Tees to the sea. Furthermore, Yarm represents pretty much the tidal (and navigational) limit of the river, so the town understandably became an important spot for trade and commerce. However, it probably owes its ancient foundation to its easily defendable position in an inverted ‘U’ in the river’s course. A royal charter granted in 1207 gave the Yarm its weekly market and two annual fairs; and the Black Friars settled in the town in the 13th century, remaining until the 1580s. The old stone bridge – still standing – was built in 1400, and the settlement grew and prospered until, essentially, merchant ships became too big to make it up river – with first Stockton, then Middlesbrough taking over the role as the River Tees’ main port. Yarm, however, remained prominent as a coaching stop – as is evidenced, at least historically, by its high number of inns and pubs. Yarm looks anything but a port these days, yet is still as charming as ever. Well, it’s not easy to unravel because it was, er, a secret, you understand. But it seems that the grounds of Kirklevington Hall, situated between the village of the same name to the south and Yarm to the north, were a hotbed of covert activity during the mid-20th century. The hall itself was built by the Richardsons of Hartlepool in around 1881, and used as a family home until the great engineering family were decimated by the Great War. The final surviving family member died in 1940, and it passed, eventually, into the hands of the military who set the place up as a secret base of sorts – a WWII command centre, in fact, for a large tract of the North-East. The hall itself was utilised, of course, and PoW pens were built in the grounds, but were never used. No one seems quite sure what else went on there, but a huge sprawling bunker was also constructed – but as far as I am able to ascertain this was built in the 1950s during the early years of the Cold War. Officially it was known as a ‘Royal Artillery Anti-Aircraft Operations Room’ (AAOR) and covered the Tees anti-aircraft zone. It seems to have formed an absolutely crucial link in our Cold War defence network. Back in the year 2000 the ‘bunker’ looked like this – not sure what has become of it since. As for the hall, well, it’s now a hotel.